Now the company boasts five state-of-the-art printers, including the Mimaki UJF-7151plus flatbed LED UV, the high speed, roll fed JV400 SUV and the flagship JV300 and CJV300 solvent printers. 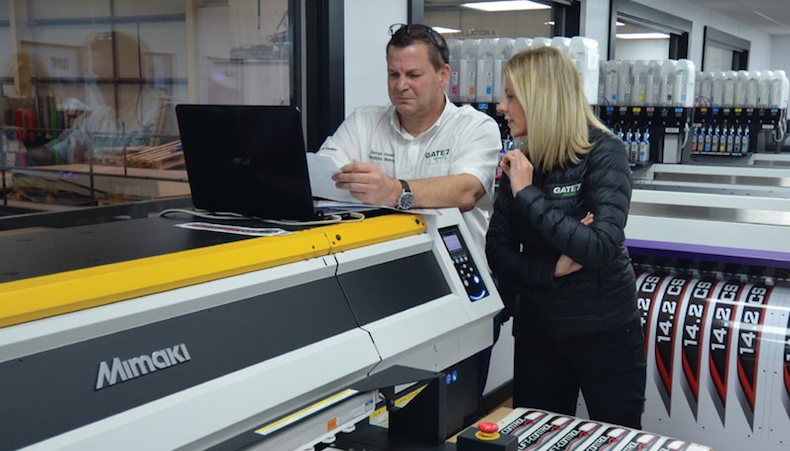 The partnership began around five years ago, when the company purchased its first Mimaki JV33 from Your Print Specialists. As well as its worldwide headquarters in Newcastle upon Tyne, the company's offices in North Carolina and Pennsylvania also host a line-up of Mimaki printers with three UJF-7151plus printers and eight JV300s. The latest purchases have enabled Gate 7 to widen the scope of printable substrates to include polypropylene and membrane switch panels. The company lists major clients including JCB, Caterpillar, Kuhn and Volvo for whom it produces high quality decals and liveries for new vehicles that are subjected to harsh and unforgiving working environments. "Our understanding of the technical capabilities of the Mimaki printers has ensured our products are superior to anything offered elsewhere." Operations manager George Heads continued: "The addition of the orange and light black inks for the JV300 and CJV300 solvent printers is a case in point; it enables us to include finer detail, more sophisticated tonal work and powerful corporate colours in the designs and it's this sort of supplier-led innovation that's helping drive our plans for significant digital expansion in 2018." Industry members that are keen to learn more about these exciting developments, as well as the many other solutions on offer from Mimaki, can visit the manufacturer at FESPA global print expo. Taking place from May 15-18 at the Messe Berlin, in Germany, the exhibition will play host to many major brands from across the global market. Mimaki is just one of a host of industry heavyweights that will be in attendance at the show, with visitors able to find the company at booth D30 in the sold-out Hall 1.2, alongside the likes of Pongs, Mutoh, Bullmer, Drytac, Marabu, Sihl or Zünd among others.